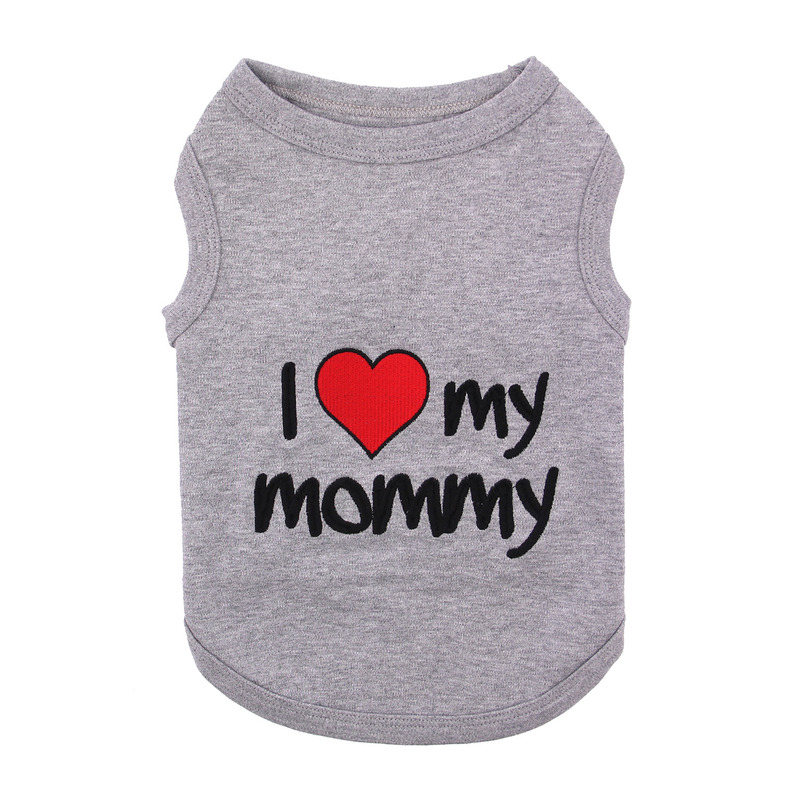 Dogs will show who they love most with our I Love My Mommy Dog Tank in Gray! I Love My Mommy Dog Tank - Gray Customer Photos - Send us your photo! We love our Mommy and Baxter Boo! Noelle got a new shirt and she loves it, just like she loves her mommy! Love my Mommy and this shirt proves it! I wore it for my 5th Birthday Party! Love my Mommy and this shirt proves it! Gucci loves dressing up. He especially loves his new shirt and that he can let everyone know that he Loves His Mommy! Ryleigh is a 17 week old Morkie who is sporting the "I ?? my mommy" tank in grey! She's the sweetest and most rambunctious 4 lb bundle of joy we could ask for! The tank fits wonderfully, is true to size and our little baby absolutely loves it!! Baxterboo is our go to store for all clothes. The quality of products and customer service makes that decision a no brainer, thanks Baxterboo! Zuzu is our now 6 month old teacup poodle who wears her heart on her new "I love Mommy " tank in Gray. Just precious ? Princess loves to wear this tank top with the tutu she got with another outfit from BaxterBoo. 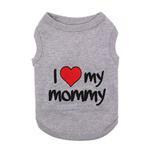 Pumpkin Loves Her Mommy, so she enjoyed wearing this shirt as a puppy to let everyone know it! Super cute! It does run small so you may want to order a size larger than usual. Posted On 05/28/18 by Yvette B from Missouri City, TX Yes, Yvette B recommends this product! Love this shirt! Great quality and fits my 5 and 8 pound Maltese perfectly. I got a small for my 5 pound baby and a medium for my 8 pound baby. Don’t pass this one up! Posted On 05/16/18 by Carol D from Beverly, MA Yes, Carol D recommends this product! I love this sweet Tee.......so well made and the HEART really stands out.......showing LOVE! Posted On 05/09/18 by Jennifer S from Morristown, TN Yes, Jennifer S recommends this product! Extremely cute and comes in sizes for the big guys. Posted On 08/18/17 by MaryAnn C from Upper Marlboro, MD Yes, MaryAnn C recommends this product! Yay! My doggie loves his mommy! Posted On 08/18/17 by Lillie T from Norfolk, VA Yes, Lillie T recommends this product! I think the I Love my Mommy shirt is adorable! Very well made, love that it is monogrammed and not just screen printed. Posted On 05/16/17 by Margo C from Phoenix, AZ Yes, Margo C recommends this product! 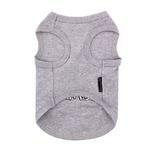 I ordered this tank top for my 4 1/2 lb shorkie. Not only does it fit perfectly, but he has received a ton of compliments on it. I have already ordered other t-shirts as well and referred this company to my friends. Great job BaxterBoo! Posted On 04/03/17 by Connie S from Raphine , VA Yes, Connie S recommends this product! Just got this shirt for my extremely large boxer. And it fits him so well. I ordered another shirt for him. Good quality material & has plenty of give making it easy to get on & off. Not baggy. It hugs his body perfectly. Posted On 03/21/17 by Terri M from Waipahu, HI Yes, Terri M recommends this product! Absolutely adorable. My sweet Pix Bull Mix Momi looks so cute in her new t-shirt and she loves it. I ordered the 3XXX size based on her chest measurement and it's a good thing I did. The shirt fits her well and there's still some wiggle room for her. The length luckily worked out well with this shirt and the quality is very well made. I advise all pet parents to be sure to measure your dogs chest size. If you don't you'll definitely end up with the wrong size. My baby's chest is 30 inch (she's a thick stocky girl) and 3XXX works very well. Posted On 01/27/17 by Mary R from Tallahassee, FL Yes, Mary R recommends this product! Posted On 12/20/16 by Jessica S from Metairie, LA Yes, Jessica S recommends this product! Absolutely to die for!!! My little man looks adorable in his t-shirt and he's definitely a mama's boy so the shirt is perfect! Posted On 12/12/16 by [email protected] from Madison, MS Yes, [email protected] recommends this product! Great shirt, bought to surprise My Wife and she loves it!! I just love. Looks so cool on my puppy. Love this t shirt, very nice quality! Posted On 10/09/16 by Shelley L from Westerville , OH Yes, Shelley L recommends this product! The quality of this shirt is great! Nice seams and the embroidery is top notch. Super cute too! Posted On 09/21/16 by Lauren D from Ewa Beach, HI Yes, Lauren D recommends this product! I love it. The embroidery is very good quality. But the bottom torso area has a ribbed edge that is a little tight. So it looks a bit silly. I am going to have to stretch it out or loosen up the stitching a bit. But it is adorable! Posted On 09/16/16 by Patrick M from E.Hartford, CT Yes, Patrick M recommends this product! Great tee ! nice looking and heavy weight good quality fabric, fits great. Posted On 09/12/16 by lynne s from East Moriches, NY Yes, lynne s recommends this product! Nice light weight to wear around the house on a chilly evening. Posted On 08/03/16 by Jaime M from Port Charlotte, FL Yes, Jaime M recommends this product! I live in Florida where breathable fabric is a must. This shirt is a perfect fit and fabric. Posted On 08/01/16 by Carol D from , CA Yes, Carol D recommends this product! Quality is super. Price would be a little high if the letters were iron on. But the letters are embroidered. Therefore I think the shirt is more than worth the price. I love great quality. This is just that, great quality for the price. Posted On 05/26/16 by Jennifer S from Morristown, TN Yes, Jennifer S recommends this product! Posted On 05/17/16 by Jennifer S from Morristown, TN Yes, Jennifer S recommends this product! I love this shirt but it runs small. Had to send back Henry's usual size for one 3x larger. Posted On 04/04/16 by Deni S from NY, NY Yes, Deni S recommends this product! I got a small for my 2.4 lb teacup poodle puppy and it goes on very easily and fits loosely but well so she doesn't mind it being on. Looks adorable. Posted a pic of her in it. Look for Zuzu on the product page. Posted On 03/23/16 by Deni S from NY, Yes, Deni S recommends this product! Love it, but it was way too small for my 2.3 lb teacup poodle if you can believe it. I will re order a small when they are available again and return the xxs. I'm getting two sizes up to make sure I can comfortably get it over her head and put her arms in without so much of a struggle. we have this for our small male. he is actually wearing it now. we also purchase this in pink for our girl dog and she loves it. A great product, its light weight but warm. Posted On 11/11/15 by Jamie G from Los Angeles, CA Yes, Jamie G recommends this product! I loved this, it was a LITTLE big on my pooch who is a french bulldog and he is about 23 lbs. However, its perfect because I know he may grow into it. Posted On 11/01/15 by Rachel Payne from Fort Wayne, IN Yes, Rachel Payne recommends this product! My boy looks good in this and he seems to like wearing it. He is so much like a child. I never thought of buying clothing for him before, but he actually likes it. The tank is made well and fits well. Posted On 10/23/15 by Anne M from , AZ Yes, Anne M recommends this product! Fits my hard to fit min pin really well. Posted On 10/10/15 by NL from , Yes, NL recommends this product! Fits really good on my puppy and its made from good material. Posted On 09/13/15 by Lisa H from Charlotte, NC Yes, Lisa H recommends this product! Simple shirt but perfect for dogs who don't like wearing clothes. It is lightweight. My dog didn't mind wearing it at all. Posted On 05/23/15 by Jeannine L from Huntsville, AL Yes, Jeannine L recommends this product! I was surprised and happy with the purchase of this shirt. It was alot better quality than I was expecting. The only con I would say is that although it fits my 20lb cocker spaniel nicely, it doesn't fit as good as I would've hoped..the neck is a little big, but the rest of the shirt fits nice. Darling Shirt Just Right for Mothers' Day! Posted On 05/23/15 by Linda K from Winterville, NC Yes, Linda K recommends this product! I have never bought a shirt from Baxter Boo that I haven't just loved - and this shirt is no exception! Endearing message says it all - and NOT just for Mothers' Day! Great shirt for my favorite Granddog! This shirt looks so adorable on my precious bichon.... The sizes run big but I figured out how to alter it to fit... Absolutely love it! Posted On 05/16/15 by Frances L from Angier, NC Yes, Frances L recommends this product! Put this tank top on your little dog and you can't help smiling. My little Maltese looks adorable in this little shirt and of course the message is the way to my heart. I think this shirt is made by Parisian Pets and their products are always made so well. All embroidered--no rubberized stickers, etc. Be sure to check sizing charts and measure your pet because Parisian Pets can run a little small. I order a medium for my 7.5 lb Maltese. Five stars from me. BaxterBoo is awesome for all my pet supplies and clothes. The prices are reasonable and customer service is great. Fast shipping.